My name is Deborah Gabbert. In my 50 years of living and loving I have explored a variety of diverse life-paths. For about a decade I was a scholar and educator of the art and science of human communication. For another decade or so, I worked in the field of alternative dispute resolution, first as support staff for a mediation training program, then as a case manager assisting people to navigate the processes of mediation and arbitration to resolve their disputes. For another decade I devoted my energies to a particular stream of personal growth and enlightenment work, developing curricula, assisting to produce and facilitate events, programs and coaching for people longing to live deeper, fuller, more potently embodied lives. Now my life has quite literally gone to the dogs. 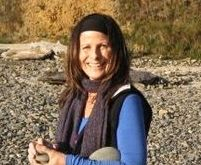 In 2011 I began a radical new phase of my life as a pet care companion – caring for and walking dogs (as well as other critters) through a fabulous locally owned and operated pet care service. Initially, walking dogs was going to be an interim gig to bring in funds while doing something I love (spend time with canines) and allowing time for my soul to rest, revive and reorient, to rediscover purpose and passion. Little did I know then that spending time cavorting with and caring for dogs would reveal itself AS my future, reawakening a dream from my youth of working with animals. What I thought would be a temporary dalliance has become instead a wildly fulfilling plunge into dogdom. When I began spending my days with dogs, I also immersed myself in personal study of canine behavior, communication and learning in order to provide the best possible experience for each and every dog in my care. In 2013 I enrolled in a local Canine Educator Internship Program with the intention of earning my credentials as a Certified Professional Dog Trainer and became owner and operator of Rex-Treks. My canine education wouldn't be complete without my own personal canine trainer, Macy, who came to live with us this past December. Macy is an extra-ordinary young dog who trotted right into our hearts as if she had always lived there. Her sweet exuberance and charm enchants those she meets, canine and human alike. She has even charmed a few felines and we all know that is no easy task! Macy and I volunteer as Certified Pet Therapy Team through Project Canine, spreading her special brand of love. You can find us doing agility play, nose work games, entertaining tricks and other enriching activities. The experience of raising this little red dog has amplified the intensity of my devotion to serving the canine-human relationship for myself and for others. 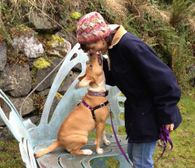 After hundreds of hours walking, playing, training and communing with a diverse sampling of Seattle’s canine population, I am a competent canine coach and resource for all things doggy. I consider myself a passionate student of canine behavior and am dedicated to enriching the lives of the dogs that I care for and enhancing human-canine relationships with the gift of understanding. My mission is to provide fun and practical coaching for peeps and their pups to enjoy the best in each other and the life they share. I have loved every moment of caring for dogs and partnering with their peeps to cultivate health, happiness and harmony in this most unique of relationships: between human and canine. I enjoy being a member of the “extended pack” and find great fulfillment in creating a deeply personal relationship with each dog in my care while supporting you, the human part of the equation, to attend to what you must during your day with an easy heart. I am a Certified Professional Dog Trainer (CPDT-KA) through the Certification Council for Professional Dog Trainers (CCPDT). I completed a 12 month Canine Educator program with Judi Anderson-Wright MA, CPDT-KA, co-owner and Director of Canine Education at Great Dog Daycare. I am also a certified PRO Dog Trainer through Absolute Dogs. I carry general liability insurance through Pet Sitters Associates, LLC and hold business licenses through the State of Washington and City of Seattle. I am a member of the Pet Professional Guild and the Association of Professional Dog Trainers. My email address is Deborah@rex-treks.com. My phone number is 206.427.3981.